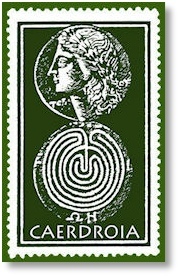 Caerdroia is always pleased to receive material for publication in the journal and inclusion in our archives. Articles, reviews, news, short notes and press clippings are welcomed, along with plans, postcards, guide books or photographs from any labyrinth or maze you may visit. Caerdroia 48 is due for publication May 2019, and submissions are now being accepted for Caerdroia 47. Deadline is December 2018 please, for publication during Spring 2019 - or thereabouts! Because Caerdroia is a non-profit making journal, all work for Caerdroia is carried out on a voluntary unpaid basis and no payment can be made for submissions. However, costs for preparing photographs and illustrations will be refunded if requested - please contact us first, we can usually arrange and negotiate reproduction permissions where required. Authors of papers and articles published in Caerdroia will of course receive a complimentary copy of the edition in which their item is published and a digital PDF version for their personal use. Our house style is based on Turabian’s Chicago Style Manual for Writers. Please visit www.press.uchicago.edu/books/turabian/manual/index.html and www.chicagomanualofstyle.org for details. Submissions should be sent electronically, in Microsoft Word .doc or .docx format. Photo placement should be marked in text, along with any caption text, but please do not embed photos or graphics into your document. Please send photos as 300 dpi .jpg or .tif attachments, and graphics likewise please, or in a suitable scalable file format - seek clarification if you are uncertain. References should be noted parenthetically in text, noting author, date, relevant page numbers, i.e. (Author, 2000, 34-35), rather than given as endnotes if possible. A bibliographic list of references should be then included at the end of your article. We typically use endnotes rather than footnotes for notes/explanatory text. Sentences should be separated by a single space after a period, not two spaces. Please don’t use your space key to manipulate text. Leave as is, or use appropriate tabs. Use traditional abbreviations as appropriate: ibid, i.e., etc., - and please use BCE and CE to denote eras. Short notes can be accepted as simple email text, but please, no coloured text or fancy backgrounds and borders, and please send photos as attachments, not embedded in the email! If you are uncertain, or need further guidance, please contact the editor.